For spinal specialists who want to remain up-to date with the latest research and strive to be the best clinician they can be. When you sign up you will receive a monthly review of the most relevant journal articles from peer reviewed journals. It is written by spinal experts working in clinic practice for spinal experts working in clinical practice. This will help you to be the best practitioner that you can be by guaranteeing you are up to date with the latest research. 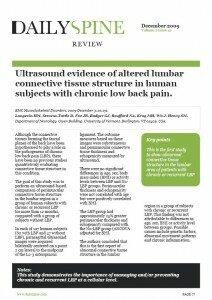 E-mail info@dailyspine.com for a complimentary copy and subscription details. We only recommend proven treatments and strategies. The Dailyspine Review of professional and research issues published every month. Copyright 2009 - 2019 Daily Spine Consulting.